Volunteer Centre Salford offers support for people who want to volunteer and volunteer-involving organisations. If you are interested in becoming a volunteer, Volunteer Centre Salford is here to help. We can help you to explore the opportunities available and match you up with the most appropriate one. There are many reasons why people volunteer. Volunteering is a great way to: meet new people build your confidence learn new skills improve your CV gain new experiences help a group or cause you are interested in...and have fun! 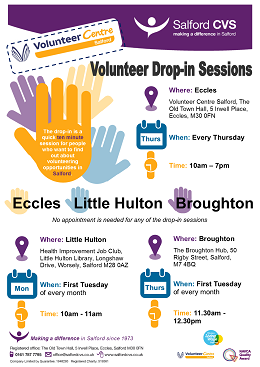 One to one appointments are for those individuals who require additional support in identifying volunteer opportunities or for anyone who can't make our drop in sessions. These sessions are available on Monday - Friday between 10am and 3pm and can last up to 45 minutes. If you would like a one to one session you will need to book an appointment in advance. If you are a supporting someone to get into volunteering (for example if you are a support worker or a case worker) and would like to bring them to a one to one session you need to first complete a referral form which you can request from the Salford CVS admin team by calling 0161 787 7795. Our volunteering portal is for people who live in Salford who are interested in volunteering. Volunteers can browse local volunteer opportunities and find roles that fit their needs and interests using the simple search function. They can then express their interest in roles online and rate their experience. Salford’s Good Practice Guidelines in Volunteer Management. Download your copy here. Access to a fund to help you cover the costs of your volunteers’ expenses. View our live grants here. Or previous grant recipients here. Do you need to recruit new volunteers to support your organisation? We can help. The first thing you need to do is register your organisation with us on our online Volunteering portal to do this you need to create a Volunteer Manager account. Click here to create an account. Visit the Volunteering Portal search page here. Or create your account here. Download a copy of our Volunteer Centre services leaflet.